Dealing with Citrix ADMX files can be confusing. But there is hope on the horizon. It looks like Citrix finally got it under control. The implementation of Citrix ADMX files has been a bit chaotic so far. Remember this view? A tad bit messy I would say. These files were clearly not in sync with one another. It seems that Citrix also realized that the above structure was not the way to go, so they implemented something new. *This file is new. It only has one purpose, which is to define the shared "Citrix Components" folder in the Group Policy editor. Download the software User Profile Manager 5.6 in the section Components that are on the product ISO but also packaged separately. Download the XenDesktop 7.12 ISO file in the section Product ISO. In XenDesktop 7.12 the new CitrixBase.admx is also available for Citrix FAS (Federated Authentication Service). To get the ADMX files you have to first install the FAS component. By default, the ADMX and ADML files are located in the directory C:\Program Files\Citrix\Federated Authentication Service\PolicyDefinitions. Please see the article Citrix Federated Authentication Service (SAML) written by Carl Stalhood on how to install and configure FAS. As far as I can tell the latest version of Citrix Sharefile does not include the unified CitrixBase.admx file yet. There is a "base ADMX" file for ShareFile itself though; the file ShareFile.admx. The ADMX files ShareFileDriveMapper.admx and ShareFileSync.admx both use the ShareFile.admx base file. The ADMX files for ShareFile On-Demand Sync for XenApp and Desktop and ShareFile Sync for Windows are identical and can be downloaded here and here. The ADMX file for ShareFile Drive Mapper can be downloaded here. The ADMX file Citrix Workspace Environment Management Agent Host Configuration v4.0.admx for Citrix Workspace Environment Management also does not yet support the CitrixBase.admx file. The file name does contain a nice typo though (Citrix Worskpace Environment). To get the ADMX files, download and extract the ZIP file containing the installation sources. The ADMX and ADML files are located in the subdirectory Configuration ADM - ADMX. On the 15th of February, Citrix released a new tool, the Connection Quality Indicator (https://support.citrix.com/article/CTX220774). This tool includes a new ADMX file, CitrixCQI.admx, as well as the CitrixBase.admx. 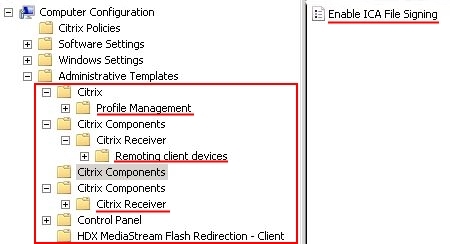 The ADMX files are located in the installation directory, which by default is: C:\Program Files (x86)\Citrix\Connection Quality Indicator\Configuration. The remainder of this paragraph explains how to update the central ADMX repository in your domain. Open the local group policy console go to Start, Run and enter the command gpedit.msc. You will now see the new ADMX files. 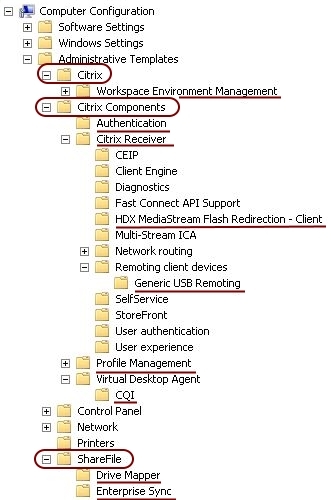 Most items are now stored under Citrix Components, except for the Workspace Environment Management and ShareFile policies. Still, it is quite an improvement I would say. I am happy with the progress Citrix made. But since I am a bit of a stickler, I still see room for improvement. For example, the name of the ADMX file should always start with "Citrix" in my opinion. This makes it a lot easier to identify all Citrix-related ADMX files in the central repository. Also, the first letter of the ADMX file should start with a capital letter, but now I am nitpicking. This entry was posted in CVAD (XenDesktop) and tagged Group Policy by Dennis Span. Bookmark the permalink. Do I understand that right: This works also for older versions of Citrix Receiver 4.x and Citrix Profile Management 5.x, right? If you are referring to the newly organized policy structure the answer is unfortunately “no”. The new ADMX file “CitrixBase.admx” is only included in the latest versions of for example Receiver (4.6) and the User Profile Manager (5.6). When you open the file “receiver.admx” (in notepad for example) you see in line 6 a reference to the name space “Citrix.Policies.Base”. This name space is defined in the “CitrixBase.admx” file in line 15. Without this reference, which is not present in older ADMX files, these policy settings will never be shown under the new common header. what about “icaclient_usb.adm”, located in Support\Configuration\en (XenApp/XenDesktop installation media)? Seems to be still not included in receiver.admx.